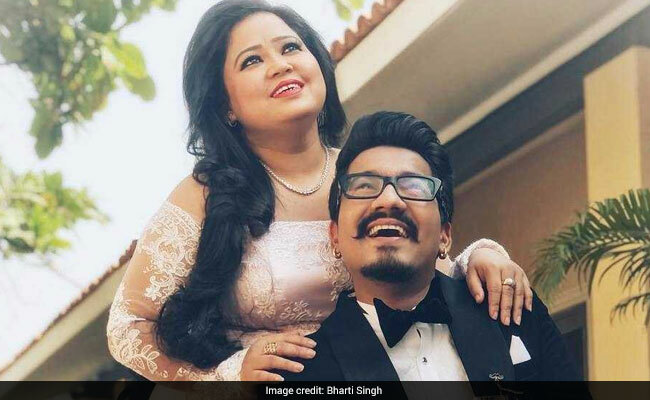 The wedding countdown has begun for comedian Bharti Singh and Haarsh Limbachiyaa. The duo, who are all set to get married on December 3, are now prepping for the wedding and the first thing, which appears to be on their to-do-list is, is the pre-wedding photoshoot. (Like every other couple). Bharti and Haarsh announced the D-date with adorable social media posts and now, the duo gave a sneak peek into their pre-wedding photoshoot. Bharti, dressed in a peach coloured gown stands beside Haarsh, who complements his bride-to-be in a tuxedo. The couple have chosen the lush green farms of Sula Vineyards for the photoshoot. "Before I met you I never knew what it was like to be able to look at someone and smile for no reason," writes Haarsh. Ummm, dulhan... no, for Bharti, it's Dulha Hum Le Jayenge. Seen this hilarious post of them yet? Bharti and Haarsh's wedding, which happens to be a three-day affair, will take place in Goa. Of their plans, the duo told The Times Of India, "For the wedding, I am wearing a Fuchsia Pink lehenga, which will have a detailed work." Bharti said, adding that the lehenga will have a bride story, designed by Akashi Designer Studio - The Adhya Designer. "For the Cocktail party I will be wearing a blood red gown designed by Ashish and Shefali and the reception and bangle ceremony outfits will be designed by Neeta Lulla," she said. Haarsh will wear a royal blue sherwani for the wedding, black tuxedo for reception and bottle green suit for the cocktail," Bharti told TOI. "I am very excited for the wedding but more for all the ceremonies, like mehendi and sangeet. I want to do it all because all throughout the year we work hard and don't get to do these things," she earlier told news agency PTI. Bharti and Haarsh together participated in the dance reality show Nach Baliye 8. They previously collaborated for Comedy Nights Bachao and The Kapil Sharma Show.